Cybereagles • View topic - FIFA Trial Plagued by Suicide, Intimidation & Murder! FIFA Trial Plagued by Suicide, Intimidation & Murder! Post subject: FIFA Trial Plagued by Suicide, Intimidation & Murder! The ongoing trial of three former South American football officials has been overshadowed by suicide, claims of witness intimidation and now, potentially, murder. Brazilian Jose Maria Marin, Peruvian Manuel Burga and Paraguayan Juan Angel Napout were three of the most powerful executives in the sport, holding important positions at world governing body Fifa. But that changed in 2015, when US law enforcement agencies began their crackdown on corruption in football. Dawn raids at the five-star Baur au Lac hotel in Zurich, where Fifa executives were sleeping soundly, became the most potent symbol of a global effort which led to more than 40 officials and executives being charged. After lengthy extradition processes, many have now accepted the charges against them, hoping to secure more lenient sentences. But Marin, Burga and Napout have consistently maintained their innocence. They are all charged with racketeering, wire fraud and money laundering. Last week their trial got under way in New York amid security levels normally reserved for major Mafia trials. 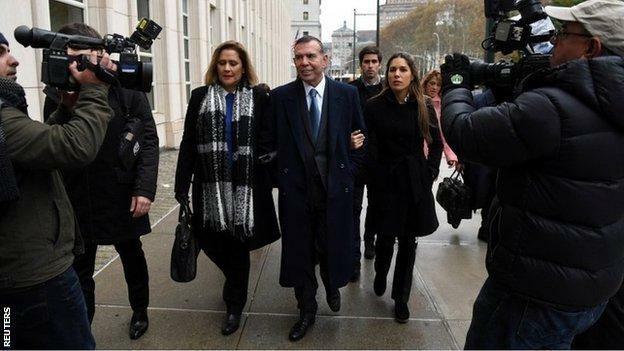 The three men have all pleaded not guilty to charges accusing them of being involved in a £120m ($150m) bribery scheme, related to broadcasting and hosting rights for football tournaments. The main prosecution witness is Argentine Alejandro Burzaco, a former banker turned TV executive. Last week he provided detailed testimony in which he accused a number of companies - including Rupert Murdoch's Fox Sports - of paying bribes to secure TV rights. Fox Sports denied it had been aware of or approved any bribes. The court has witnessed dramatic scenes too, reminiscent of a Hollywood drama. Burzaco broke down in tears at one point after Burga allegedly made two throat-slashing gestures towards him. The Peruvian is now facing charges of witness intimidation despite his lawyers insisting their client was merely scratching a skin complaint on his neck. The case has also been overshadowed by the suicide of one former Argentine government official named in court as receiving bribes. And, on Sunday night, Adolfo Lagos - the vice-president of a company that has also been named in the corruption case - was shot dead in Mexico City. It should be said, however, that it is unknown if there is a direct link to the trial - with suspicions Lagos may have been the victim of a violent robbery while riding his bicycle. Testimony from other witnesses is due in the coming weeks, some of which may well have wider implications. Burzaco has alleged that a process of annual and one-off bribes, often over $1m, were given to a group of high-ranking executives of Conmebol, South American football's governing confederation, in relation to Qatar's bid to host the 2022 World Cup. 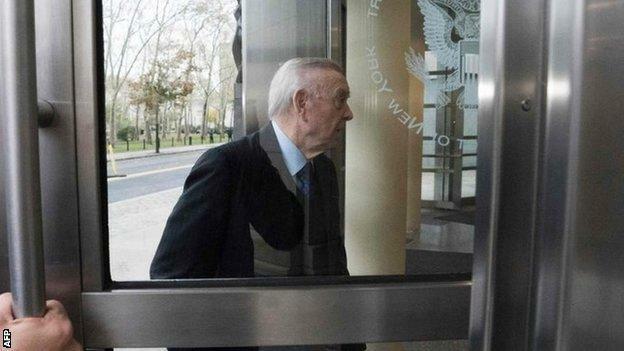 Specifically, he alleged the late Julio Grondona - formerly senior vice-president at Fifa, and former head of the Argentine Football Association - told him he "took" $1m from another official, stating he was owed the money in exchange for his vote, which helped Qatar secure the tournament. It is not known if and to whom the money was paid. The Qatar 2022 organising committee has always insisted it committed no wrongdoing during the bid process, which culminated in December 2010. Speaking at a news conference on Monday, Hassan Al Thawadi, Qatar's most senior World Cup official, said the country has nothing to fear from the ongoing court proceedings in New York. "It is all hearsay and there is no evidence. We are confident in the integrity of our bid," he said. The case is set to continue for another five weeks, with further revelations guaranteed.